Overview: This game will keep you entertained way past the holidays. After many years of working on Christmas day... Rudolph has had enough! Find the bombs (filled with free games) to complete his revenge. During normal play "Rudolph" substitutes for all other symbols except scattered "Bombs". 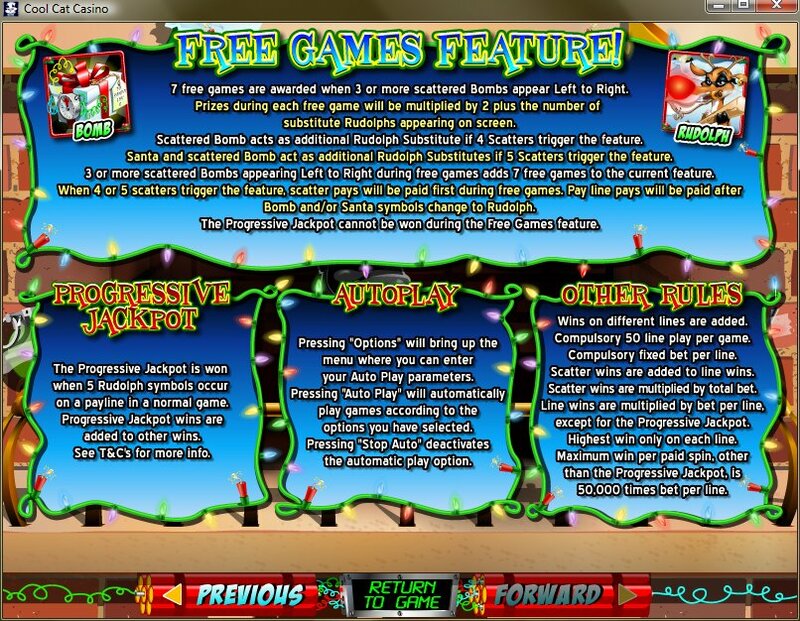 Rudolph's Revenge Free Game Feature is triggered when 3 or more scattered "Bombs" appear left to right awarding 7 free games. Prizes during each free game will be multiplied by 2 plus the number of substitute Rudolph's appearing on screen. Scattered "Bombs" acts as additional "Rudolph" Substitute if 4 Scatters trigger the feature. Santa and scattered Bomb act as additional Rudolph Substitutes if 5 Scatters trigger the feature. 3 or more scattered Bombs appearing Left to Right during free games adds 7 free games to the current feature. When 4 or 5 scatters trigger the feature, scatter pays will be paid first during free games. Pay line pays will be paid after Bomb and/or Santa symbols change to Rudolph. 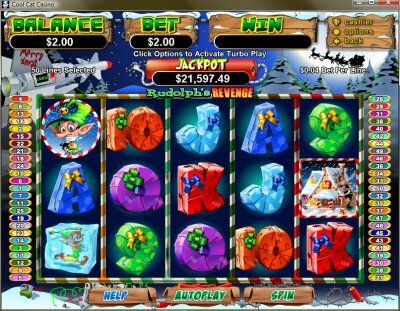 Similar Slots: If you like Rudolph's Revenge, you might like these other slot machines from RTG: Bulls and Bears, Field of Green, Football Frenzy, Incan Goddess, Naughty or Nice?, Year of Fortune.